Zu meinem heutigen Morgenkaffee und der obligatorischen Leberkäs’semmel kamen heute mal 2 Clementinen. Bin gestern endlich mal dazu gekommen meinen Obstvorrat wieder etwas aufzustocken. 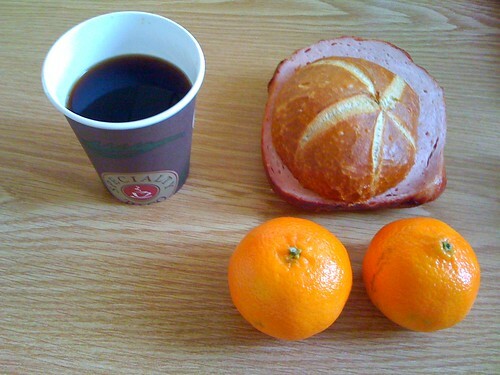 This entry was posted on Wednesday, November 25th, 2009 at 08:43	and is filed under breakfast, kulinarisches. You can follow any responses to this entry through the RSS 2.0 feed. You can leave a response, or trackback from your own site.